Digital Society Leeds celebrates eight years at the forefront of the UK Trance scene with the biggest event programme in DS history. On the main stage, three very special Trance heavyweight headlines top the bill - the Godfather of Trance PAUL VAN DYK, the Legendary FERRY CORSTEN, and uplifting maestro's ALY & FILA. Joining these three colossal acts is an array of superstar DJs, a back to back DS8 exclusive with ANDY MOOR & LANGE, the on fire SEAN TYAS, Goldrush hero BEN GOLD, Society favourite MENNO DE JONG, and resident supreme WILL HOLLAND. 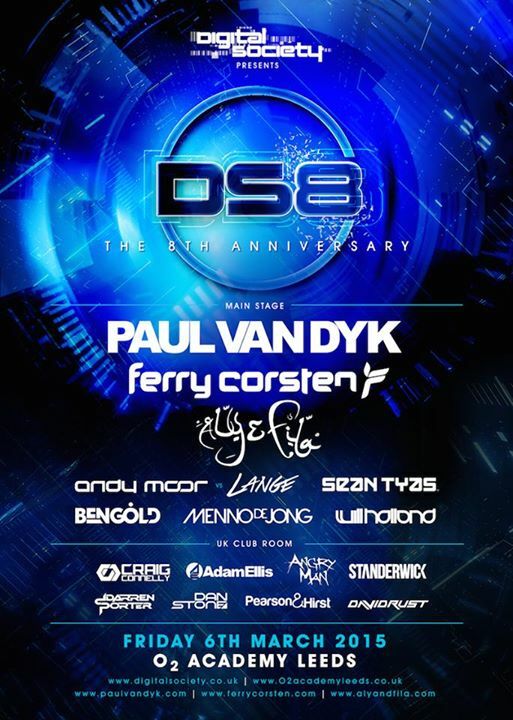 In the Club Room, DS welcomes eight of the most exciting producers in UK Trance to the anniversary, confirming DS8 as the ultimate Trance celebration - featuring super talents CRAIG CONNELLY, ADAM ELLIS, ANGRY MAN, STANDERWICK, DARREN PORTER, and DAN STONE, plus support from PEARSON & HIRST and DAVID RUST. Over 20000 dance music fans have visited Digital Society events in Leeds, featuring artists such as Above & Beyond, Gareth Emery, John O'Callaghan, Eddie Halliwell, Paul Oakenfold, Markus Schulz to name a few, and with Paul van Dyk, Ferry Corsten and Aly & Fila heading up a unique and very special production spectacular show, even bigger and better than ever before - the Digital Society 8th Birthday and O2 Academy Leeds host a fitting stage for one of the UK's most iconic Trance events of the year. In this Digital era, a Society unites.